Some the biggest achievers today have daily rituals or habits that help to set there day into a success. Whether it is getting up at 5.00am, meditating, visualising the day, going for a bike ride or some other quirk there seems to be a hidden blessing beyond the simple act of a habit. Stefan Sagmeister, renowned designer, he gets up every morning at 5 a.m. simply because it’s more exciting to start working than to turn around and sleep some more. I do seem to have a lot of energy. After enjoying a giant pot of coffee and a medium-sized cigar for breakfast, I start my daily schedule of little experiments. Oprah Winfrey – Oprah – has said she sits in stillness for 20 minutes, twice a day. Verne Harnish in his classic book Rockefeller Habits talks about John Rockefeller’s daily habits that helped bring the success of his day. John Rockefeller was one of the most significant American businessman in history. Rockefeller’s disciplined approach to business replaced the helter-skelter methods of the original pioneering speculators. The amazing thing with habits is they set your day, week year apart. The general message is that if you increase the frequency of something you will naturally increase the results! 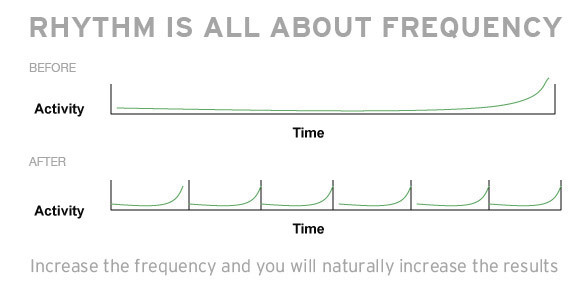 If you change nothing else except increase the frequency you will increase the results, it is that simple. This is the first underlying element of rhythm. The second underlying principle of rhythm is routine. Routine sets you free. Is anyone here a jazz musician? If so, you understand what we are talking about. In jazz there is an underlying rhythm, or beat, that all jazz musicians adhere to. This allows musicians who have never played together before to sit down and create beautiful music. To a listener there is great improvisation taking place and the music seems to be very spontaneous and creative. This made possible due to a strict underlying rhythm. A good meeting rhythm allows executive teams to capitalize on these two underlying principles. An executive team meeting rhythm is a container that increases the frequency and frees individuals to be creative within the structure. Both of these will lead to increased results for the company. Weekly executive team meeting/call – 60 – 90 min.